Ok that might be a little bit of exaggeration but the new version of TweetDeck really has gotten an awesome speed boost. Twitter introduced User Streams API earlier that allowed for instant delivery of tweets. The older API allowed for the clients tto check for new tweets every few minutes. TweetDeck launched a new version with the User Streams API but I found it a bit buggy to use. Today, in a new version update, TweetDeck has brought the User Streams API into the main version. Once you install the new version v0.36, you will have the new stream feature enabled. The tweets you see are in real time and are updated as they happen instead of the old way where TweetDeck would poll every few minutes for new updates. This can be really useful and kind of give the same functionality of TwitterFall.com inside TweetDeck. You can’t just expect to jump into your F-14 and start buzzing the tower without a few pointers. So here are a few key articles from our support site that should help you understand some of the finer points of streaming updates in TweetDeck. 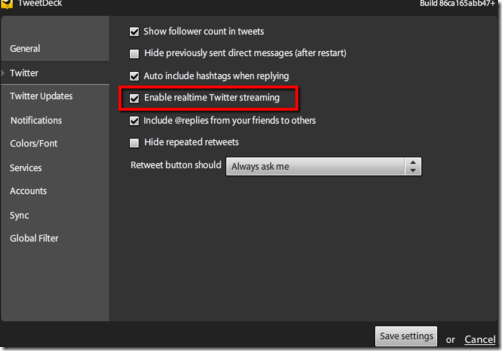 Twitter does not yet include Lists in the Streaming API. Voice your support for them to be included here. Other than that, just strap yourself in and enjoy Twitter the way it was meant to be – in TweetDeck and in true real-time! If you are thinking you may not use this feature and don’t need to upgrade your TweetDeck, think again. Twitter seems to have made another major architectural change behind the scenes. Twitter is switching to a new way of assigning unique identifiers to each tweet in it’s database. This new method, dubbed "Snowflake", has forced us to make some fundamental changes behind the scenes in TweetDeck. The result of all this techno-jiggery-pokery is that you *must* update to at least v0.36 urgently. If you have not upgraded before 24th November then your TweetDeck will start going very wrong. So, make sure you update your TweetDeck before Nov 24. Thanks for the head’s up. The new streaming Tweetdeck is definitely awesome, but can certainly get overwhelming if you’ve got a lot of people that you’re following. I haven’t used TweetDeck before, I’ll have to check it out. I wonder if it is effective for social promotion.